"You are the one responsible for entering this race, you better be prepared for the course itself. The rocks will have no mercy. 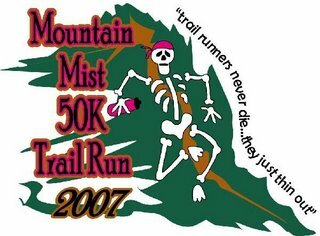 I have seen this course rip apart many a "good trail runner." Mountain Mist is trail running in its finest form. No one is ever let down, just shut down, beaten up, broken and left bleeding. You first timers beware, this course may cause you bodily harm. Even though you have entered the race and paid the fee...YOU CAN STILL BACK OUT! No one will laugh at you, just tell them your family still needs you and you want to continue running in the future, they'll understand! Otherwise, "know your limits and then completely ignore them.""